Take a US fleet and survive the various encounters with the former Soviet Navy, the Chinese Navy, the Indian Navy, and many others. Most of the world's navy are included. Issue orders in real-time and watch your orders being carried out. Launch strike aircraft to take out enemy ships. Launch cruise missiles to destroy enemy airbases. Launch helicopters to prosecute hostile subs. Watch your ships defend themselves against incoming cruise missiles. This is the ultimate real-time challenge. 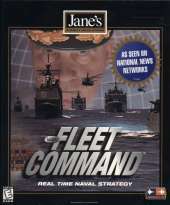 Do you have what it takes to assume Fleet Command?